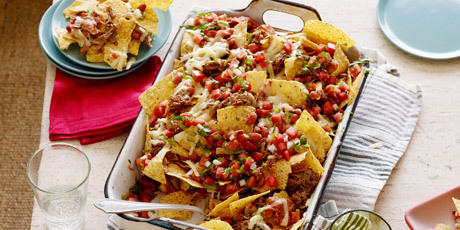 The ultimate party nachos, tortilla chips are layered with braised beef brisket and a bacon bean mixture. You'll never look at nachos the same way again. 1. Heat up the Pinto Beans and doctor them to your desired "temperature," adding some ground black pepper, Tabasco sauce, minced garlic and jalapenos if using. Make them as spicy or mild as you like. 3. In a very hot skillet, add a bit of canola oil and the Braised Beef Brisket. Cook for 1 to 2 minutes, and then flip and cook for another 1 to 2 minutes. Next, pour some of the red sauce over the meat to make it nice and moist. If you have them, also add a bit of the pan drippings from the brisket-cooking process (or a bit of beef broth — again just enough to bring the meat to a nice moist consistency). Stir to combine and remove from the heat. 4. To assemble: In a heatproof dish, layer half of the tortilla chips, beans, brisket, cheese and Pico de Gallo. Repeat the layers but leave off the second layer of Pico de Gallo until after the dish is cooked. 5. Place on the middle or bottom rack of your oven and broil until the cheese is melted. Watch closely so they don't burn. Sprinkle the remaining Pico de Gallo over the top before serving. 6. Inhale, exhale and then ravenously consume! 2. Toward the end of the cooking time, add 1 teaspoon salt and 2 teaspoons pepper. Check the seasoning before serving, and add more salt and pepper if desired. Don't over-salt. Yield: 12 servings. 1. Combine the beef consomme, soy sauce, lemon juice, liquid smoke and garlic in a large roasting pan (a disposable is just fine). Place the brisket in the marinade, fat-side up. Cover tightly with foil. Marinate in the refrigerator for 24 to 48 hours. 2. When ready to cook, preheat the oven to 300°F. 3. Cook the brisket in the foil-covered pan until fork-tender, about 40 minutes per pound (6 to 7 hours). Transfer to a cutting board, slice against the grain and put the slices back into the cooking liquid. Serve immediately, spooning the juice over the slices. 4. You may store the pan in the fridge for up to 2 days, or freeze for use at a later date. If fat collects and hardens at the top, remove and discard. 1. Chop the tomatoes, jalapenos and onions into a very small dice. (Leave the seeds in your jalapenos for a hotter pico.) Adjust the amount of jalapenos to your preferred temperature. 2. Next, chop up a nice-sized bunch of cilantro. Just remove and discard the long leafless stems before chopping. No need to remove the leaves from the stems completely. 3. Put the tomatoes, jalapenos, onions and cilantro together in a bowl and give it a good stir. Squeeze the juice of the lime half into the bowl. Add salt to taste and stir again. Yield: 6 servings.